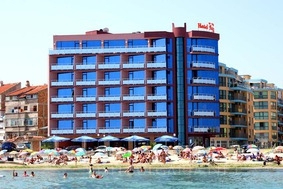 Location: Sunny Bay hotel is located on the first line just 1 minute walk from the beach in Pomorie Black Sea resort, right on the beach. The center of Pomorie is 1 km away from the hotel, Sunny Beach is 8 km away and the ancient town of Nesebar is a 15-minute drive away. Burgas city centre is 20 km and Burgas airport is 8 km away. Accommodation: The hotel features 6 storeys and 48 tastefully furnished and fully equipped double rooms. The double rooms are about 25 sq.m. They feature double bed or two single beds, air-conditioner, balcony, phone, mini bar, bath-tub or shower, hair-drier. Bars and restaurants: The hotel offers a cosy restaurant serving Bulgarian specialties and international cuisine.